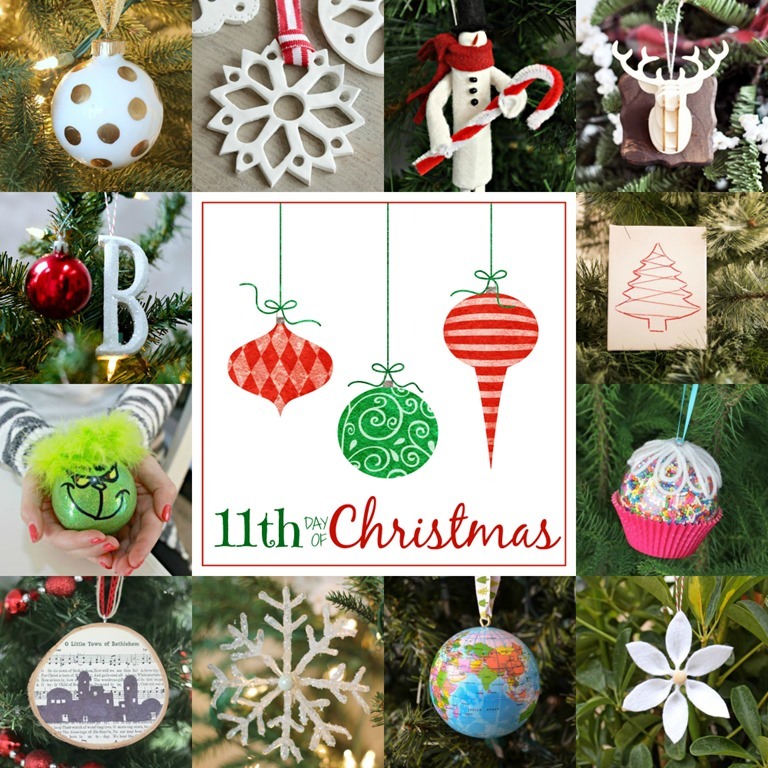 Happy Day 11 of the 12 days of DIY Christmas Ornaments! Is anyone still reading?! 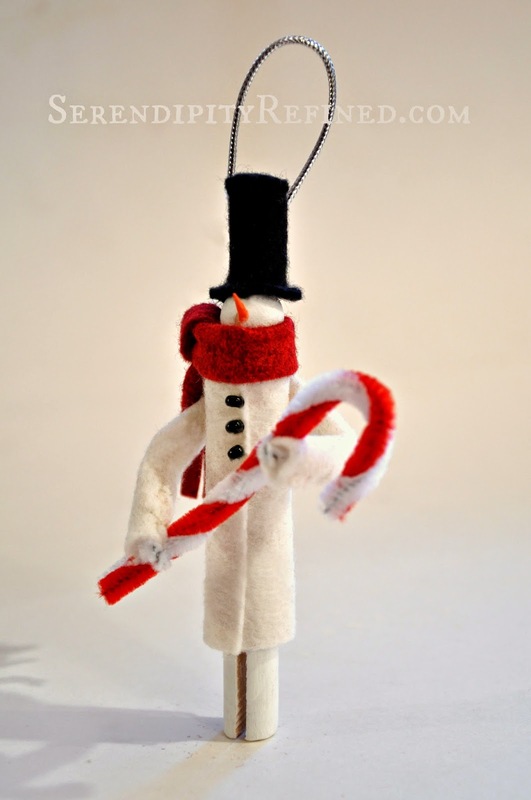 Today we're making a sweet clothespin snowman dressed in felt and carrying a pipe cleaner candy cane. To tell you the truth, I'm running out of things to say. Don't get me wrong, I love teaching everyone how to make these ornaments but writing eleven tutorials in a row has been much more difficult than I imagined that it would be. Let's get to it! 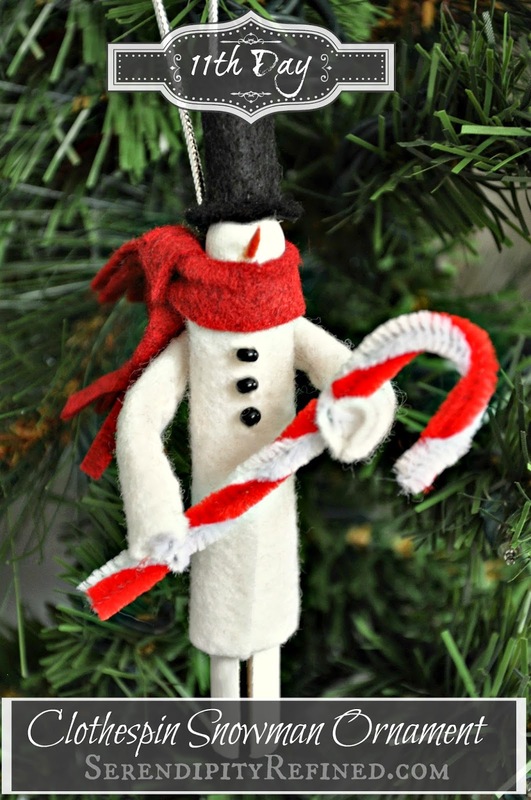 This is a really easy ornament to make and, other than his hat and arms, the entire ornament was assembled with HOT GLUE! Cut a strip of red felt approximately 1 inch wide and 8 inches long for the scarf. Fringe the ends. 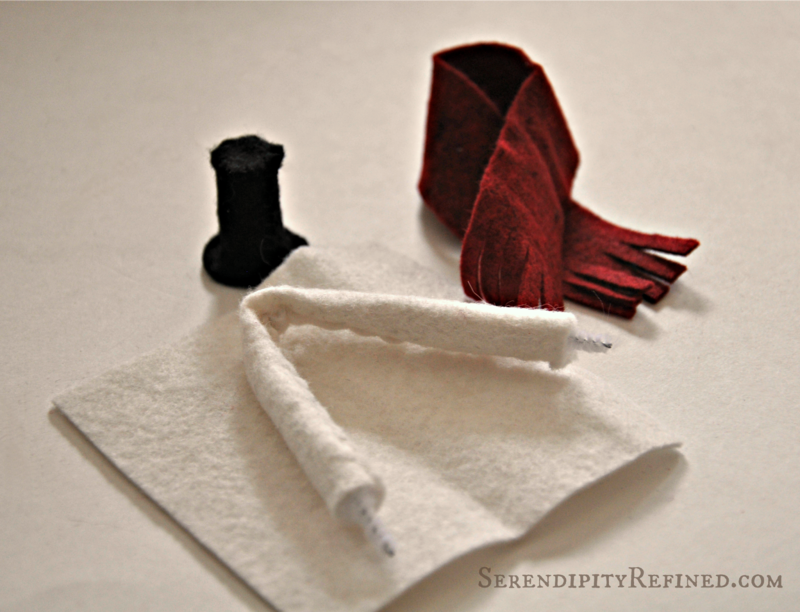 Cut a piece of white felt 1 inch shorter than 1/2 of a chenille stem (arms). Wrap it around the stem and secure with hot glue or stitch. Cut a piece of white felt that is the 1 1/4 inches shorter than the clothespin and wide enough to wrap around the clothespin and overlap by about 3/8 inch. Form a hat from black felt. The brim on mine was slightly smaller than a quarter, the hat is about 1 1/4 inches tall and the top is slightly smaller than a dime. 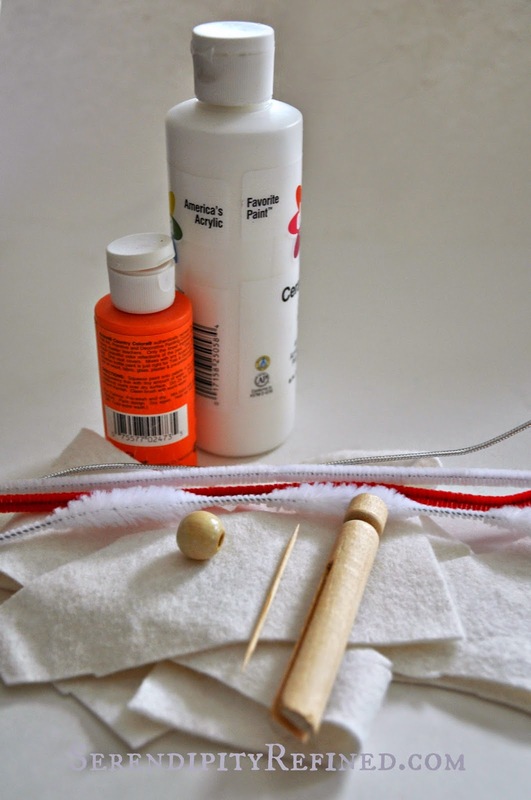 Glue the wood bead to the clothespin and paint the assembled piece white. Paint the tooth pick orange. Cut off about 1/2 inch of one end and glue it onto the wood bead for the nose. Wrap the "coat" piece around the snowman and hot glue. Wrap the scarf around the neck. Hot glue the hat to the head. Hot glue the arms at the back just below the scarf. Twist the red and white pipe cleaners together and bend to form candy cane. Bend the ends of the chenille stem around the candy cane. Hot glue beads on the coat for buttons. Form a ring from the silver cord and hot glue it to the back of the head. Here's what my friends are making today. Click on the links to see the tutorials. Have you noticed that these ornaments are getting easier? Well they are! 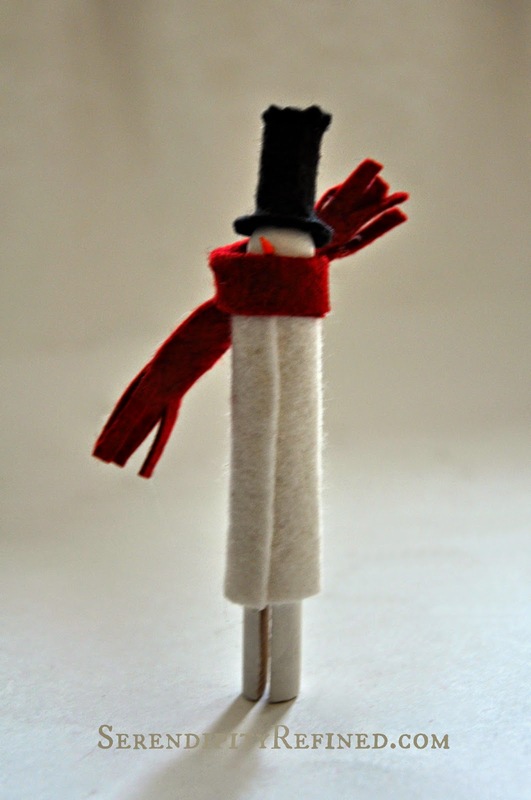 This simple clothespin snowman is so easy that I think that it's a great ornament to make with children and if you think that this one's easy, stop by tomorrow and see an ornament that's made with only three items.